Grease a 9-inch round cake pan. In a small bowl combine streusel ingredients. Set aside. In a large bowl combine dry ingredients. Set aside. In another bowl, combine buttermilk, oil, egg, and vanilla. Gently stir buttermilk mixture into flour mixture. Lumpy is good. Gently fold the blueberries into batter. Do not over-mix. Spread into pan and top with streusel. Bake for 30 minutes or until a toothpick inserted in the center comes out clean. No buttermilk? See "Substitutions" in my blog. 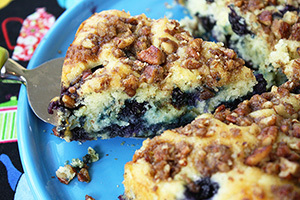 11 Comments on "Blueberry Coffee Cake"
Can I make this and freeze it for use later in the week? Hello Jenny, I have a question about the whole wheat PASTRY flour.. I have never heard of this ’till now.. What is the difference.. And. can I use regular whole wheat flour with some additions..Ie..baking powder or soda …Thanks ..
Just want to say thank so you so much for sharing. 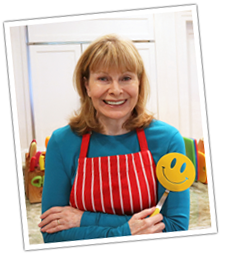 I have made quite a few of your recipes and you have reignited my passion for cooking again. Love the videos you make it fun not like a chore as it has felt like for quite some time. Can I replace the transfat-free spread/butter with a tbsp of flaxseed? I’m sorry I don’t know. I have never used flax seed this way, only in baking muffins. Made these two days ago and they are still tasty! my fresh blueberries are in the freezer for quite a month now, can i use this kind of blueberries in this cake? I have no experience with frozen blueberries but I can’t see how they would be as good as fresh. If you add them frozen they might be too heavy and fall into the bottom of the cake. If you thaw them, they may too soft and mushy. I wish I had the answer but I’m not sure. This recipe is fabulous! I made it yesterday and my sweetheart says it is the best coffee cake I’ve ever made. We are very much into whole grains, so I used all whole wheat flour, and even though it’s not as white and yellow as yours in the photograph above, it is every bit as light and fluffy in the mouth. Amazing that whole wheat can turn out so tender. I also used two cups blueberries, as one cup did not cover the pan and I had plenty to spare. So good. I’m sharing it as the Recipe of the Day on a Facebook page I curate called Cooking with Whole Grains & Whole Foods. Thanks so much for a truly scrumptious recipe. Gonna have to run an extra mile tomorrow morning, thanks Jenny…lol….so good… Dang, back for seconds….add another mile, it’s worth it! My FAQs answer many question. I am not always able to answer questions. Copyright © 2019 JennyCanCook.com. All rights reserved.